Getting our backyard prairie certified with Mary Fortmann of Conserve Lake County (on the right). Shown here is a “very happy” Rattlesnake Master plant! Recently, my husband Aaron and I made good on a promise. In April of this year, I made a public pledge to work towards getting our 9 acres of property in Long Grove certified for eco-friendly practices and land stewardship (see my prior post, Accepting the Conservation Challenge). 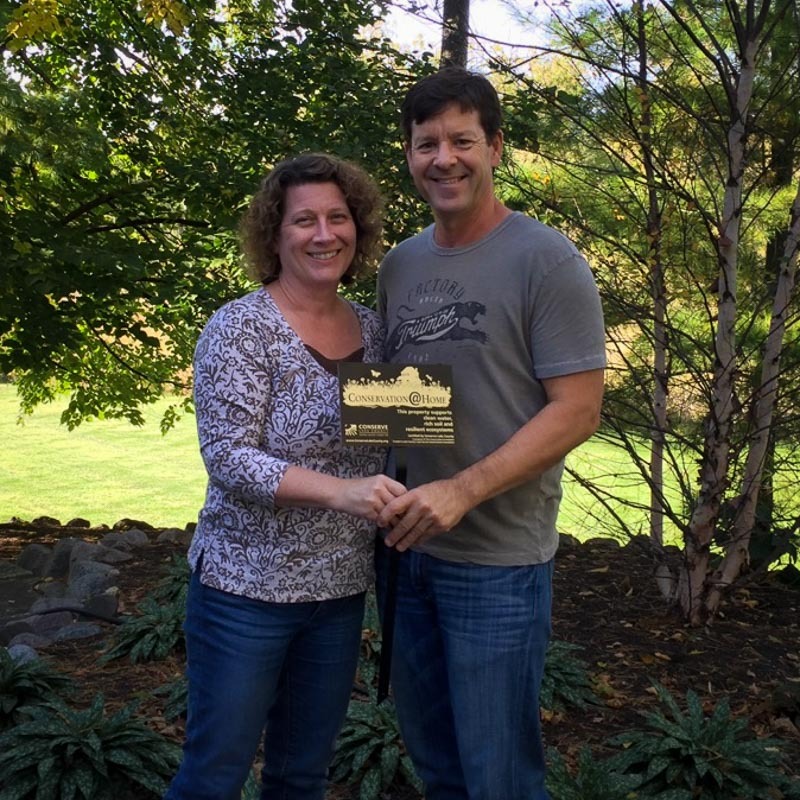 Last week, I am happy to say, we passed the inspection and are now the proud owners of a “Conserve@Home” yard sign! 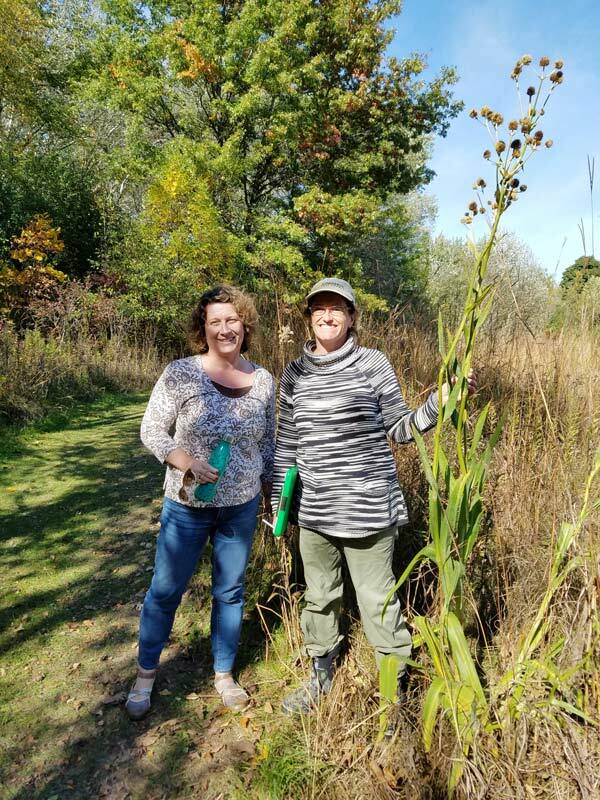 We were lucky to enjoy a particularly beautiful October day for our visit from Conserve Lake County consultant, Mary Fortmann. While showing her around our yard, gardens, prairie and woodlands, we chatted about all the things we have done so far to help preserve the many native treasures. Mary had a wealth of knowledge about things growing in our yard that we weren’t sure of, in particular a prairie plant that we had never seen before and hadn’t identified yet. Turns out it is a huge rattlesnake master (Eryngium yuccifolium) plant–the tallest one Mary had ever seen! Aaron and I learned so much from our consultation, particularly about species that we didn’t know we had (like Japanese barberry) and didn’t know were invasive (like burning bush). We received lots of tips and suggestions on lawn care and mulching that we will use now and next season. Mary identified many baby oak and hickory trees growing in the native woodland area of our property. I love her suggestion to transplant some of these seedlings to our more “suburban” area of the yard–why hadn’t that thought ever occurred to me? Brilliant! We now have several goals for next year including continuing our efforts at controlling the many invasive species starting to creep in such as teasel and reed canary grass. It will be an ongoing battle, but one worth fighting. I would like to encourage all residents of Long Grove to schedule a consultation and learn more about how you can enhance your landscape in a sustainable way. The amount of personalized information we received was well worth the $50. charge. In addition, if you schedule a visit for 2017 before the end of this year, the Village of Long Grove will refund half the cost of your consultation ($25) as a way of encouragement. I was so delighted to get my own property certified, that I posted the picture above on Facebook, bragging about the giant specimen. My neighbor Claire threw down a challenge for next year–she is going to grow the biggest rattlesnake master in the neighborhood. Game on! Proudly displaying our new yard sign showing that our property is certified!